Take your wound management and treatment skills to the next level with Comprehensive Wound Management, Second Edition . Both physical therapy students and practicing clinicians of varying wound experience will be well prepared to identify and treat a variety of wounds beyond those covered in traditional textbooks such as pressure, neuropathic, venous, and arterial ulcers. 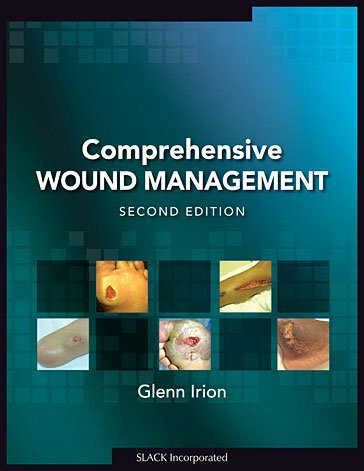 Comprehensive Wound Management, Second Edition by Dr. Glenn Irion is a unique text that covers the spectrum of acute and chronic wounds. This encompassing text includes full color images, as well as chapter discussions on each type of intervention, prevention strategies and administrative concerns that impact the delivery of wound management services. Follows the International Classification of Functioning, Disability, and Health . Based on the Guide for Integumentary/Wound Management Content in Professional Physical Therapist Education developed by American Physical Therapy Association's Section on Clinical Electrophysiology and Wound Management. Along with providing key information on all aspects of wound management, this updated second edition , references the need to not only examine the wound but the patient as well, so that successful clinical judgments and developing effective treatment plans can be made. Comprehensive Wound Management, Second Edition is an invaluable text that should be in the hands of all physical therapy students and clinicians, certified wound specialists, rehabilitation professionals, and any health care provider who is managing the treatment of wounds. Dr. Irion is certified as a Wound Specialist through the American Academy of Wound Management and is Associate Professor at the University of South Alabama where he teaches integumentary, cardiovascular and pulmonary, and basic physical therapy skills. He practices wound management at Mobile Infirmary Medical Center. The author received a PhD in Physiology at Temple University School of Medicine and furthered his research skills during postdoctoral fellowships at the Medical College of Virginia (Virginia Commonwealth University) and the University of Cincinnati/ Cincinnati Children’s Hospital. He is the author of more than 40 research articles, and co-editor with his wife, Jean, of Women’s Health in Physical Therapy. Instructors: Visit our new website especially for you at efacultylounge.com! Through this website you will be able to access a variety of materials including, Comprehensive Wound Management, Second Edition Instructor’s Material. Available on-line, this exciting material will be of value to facilitate optimum student-instructor discussions.